A range of adjustable louvres designed to act as a source of controllable airflow either for inlet air or exhaust. Individual louvre units contain moveable blades which are mounted into robust box frames. 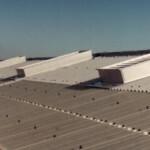 Louvre blades are adjustable to provide controlled ventilation. Offered as single units or alternatively they may be mounted into continuous louvre banks to any height or width. 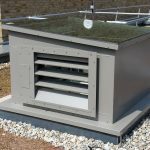 All louvres are suitable for mounting into cladding, glazing and brickwork with flanges formed to suit any mounting detail. A comprehensive range of controls are available to suit specific requirements. Offered in a choice of aluminium or steel, either in mill finish or PPC. Also available manufactured using pre-coated materials. The louvre system was subjected to a series of independently controlled tests to determine the aerodynamic performance of the design. Top, bottom and side flanges may be formed to whatever mounting detail is required. For additional information please consult the separate form entitled Details Required for Manufacture. Operating louvres can be sprung loaded to either open or close. Where units are to be mounted in continuous horizontal runs, joining plates are supplied for weathering. 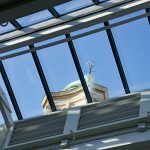 Louvres can be specified to have louvre blades adjustable to any position between fully open and closed to give infinitely variable amounts of airflow. Assistance with scheme design and selection is offered by our experienced technical team.